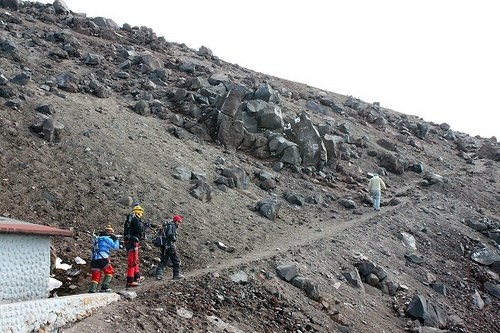 Two grueling hours of climbing through ashy volcanic dirt, each frustrating step taken, I slid backward half a step. We progressed slowly, rhythmically. Sergio, our Ecuadorian guide lead the way, with Stonie and I tagging along, bundled up in bright blue and red, wearing steel-toed boots, equipped with a light daypack and glacial-climbing equipment, our hot faces wanting to break a sweat but unable to do so in the biting cold. The school-bus yellow roof of the refuge stood out from its ashen surrounds. It hadn’t looked so far from where we started in the parking lot, a short 300-meter climb. However, the incline was 2,000 feet in length, quite a gradient. 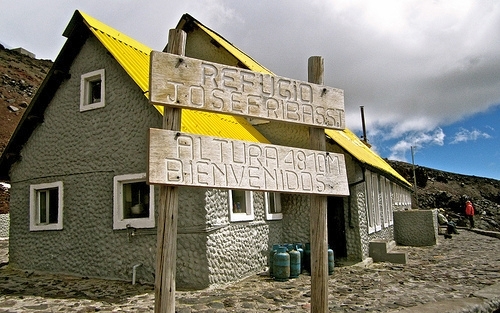 We arrived at the Refugio José Ribas (15,780 feet) exhausted. Gusts of wind wrapped themselves around the building almost in contempt of our presence. My skin felt clammy, and my breath deepened in the elevation. 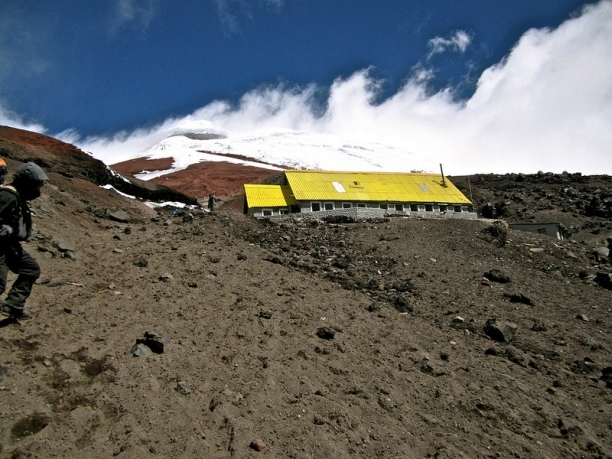 We retreated inside for lunch, with the intent of climbing to the summit of Cotopaxi at midnight. 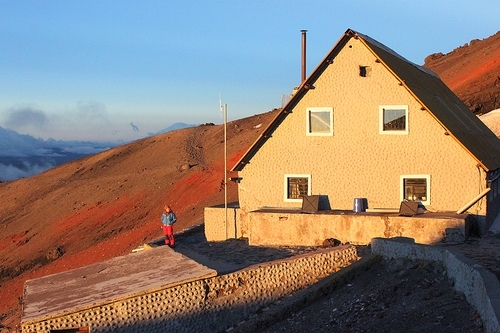 Cotopaxi is one of the three highest active volcanoes in the world at 19,347 feet. It’s not an especially technical climb. However, it can be quite a challenging one for those who make the attempt, certainly for non-mountaineers such as myself. 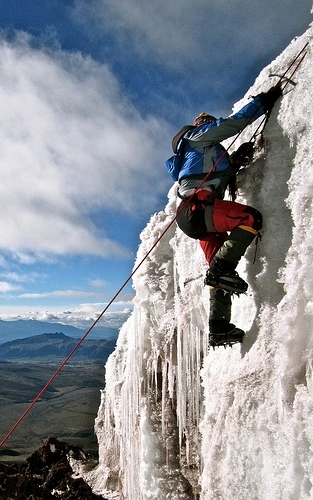 Mountaineering had never interested me, but there was something about Cotopaxi that attracted me. Perhaps it was its perfect conical peak or the idea of hiking a glacier wearing the spiky shoes — crampons, I later learned they’re called. I was drawn to it. I wanted to conquer it before leaving Ecuador. I envisioned peering into the eye of the volcano with arms outstretched in the air, taking in the panoramic view. I had been training for hours each day the previous six weeks, running and climbing the steps of Cuenca (7,500 feet). I spent three days before the climb hiking in altitudes up to 15,000 feet in the beautiful countryside of Quilatoa Loop. I was prepared physically, and I was prepared mentally. Or so I thought. We laid out our sleeping bags on one of the 70 odd bunk beds in the refuge, stowed our packs away and ate a meager, tasteless lunch of bread, ham and cheese, along with peppermint tea. It wasn’t much, but enough to restore our energy. After settling in, we wandered outside to take in the magnificent views of Quito and the surrounding mountains. I was grateful for the blue skies and the sun’s attempt to burn through the bitter cold. I peered up at the summit of the volcano. Whether smoke or a snowdrift, it appeared to be smoking, steady and sophisticated, like a cigar. After a brief rest, we headed to the glacier for skills training. We hiked another hour in the ashy dirt, our ice picks thrown over our shoulders as miners do after a long day’s work. My eyes fell upon the glacier up for the first time and I was immediately overwhelmed. It loomed in front of me, bold and challenging me to take it on. My first sense of doubt set in. I surveyed the surreal surrounds, the snow-covered ice, the deep crevasses and small, narrow canyons, the enormous icicles hanging down like crystal stalactites, dripping water and glistening in the afternoon sun. We tied them on. I scrutinized the sharp metal now attached firmly to my boot like a gladiator sandal weapon. I pushed myself up to stand, the new footwear foreign and awkward. I took a few steps in the dirt the same way a toddler on wobbly legs would. The three of us stepped up and onto the glacier at Sergio’s command. “Ten point steps,” he demonstrated driving all points of the crampon into the ice with a few steps. “Then, two point steps.” He walked up a steeper gradient using just the front spikes almost on tiptoe, taking long, steady strides. We followed after him, our ankles twisting inside our boots, using muscles that don’t often get much use. After becoming acquainted with basic walking, we practiced what to do if we fell. Playfully, we rolled down the face of the glacier with distressed cries and plunged our ice picks into the terrain to stop ourselves. We picked ourselves up, brushed ourselves off and dug the lethal footwear back into the ice, ready to begin climbing again. For our final test, strapped together by our harnesses, we made our way into a crevasse with walls 26 feet high. Sergio rigged up climbing ropes with a piton, and imitating his demonstration, I climbed the wall first with two ice picks, one in each hand. I drove the right one into the ice wall; then the left one, followed by one solid kick of my right foot, securing the two front spikes of the crampon; then the other foot. I had made it off the ground and I already felt my muscles straining. Sergio held onto the ropes and kept a tight grip, allowing me to focus my strength on progressing upward. I repeated the process again: right hand, left hand, right foot, left foot, pulling myself up with my arms while pushing with my legs, alternating upper body strength with lower body strength. Every inch of progress I made, Sergio tightened the ropes to keep me from falling. Halfway up, my left arm had lost its strength. I couldn’t propel the pick hard enough to stick into the ice. I drove the right pick into the wall and used my right arm to drive the left pick in as well. Foot by foot, I pulled myself to the top with Sergio doing much of the work to hold me in place. I reached the top, breathing heavily, arms shaking and eager to abseil down, eager to get back into the warm refuge with a cup of tea. Sergio cackled as I untied the ropes from my harness. “What’s so funny?” I asked, eyeing him suspiciously. After dinner, beef and rice, Stonie and I crawled into our sleeping bags in an attempt to sleep until midnight. Wrapped up, my feet were freezing in my thick, woolen socks. My body rattled as I tried to coax myself to sleep. A few hours of broken sleep later and we were awoken at midnight by the movements of other climbers in the refuge readying their gear. The wind rapped against the refuge, the sound of huge ocean waves crashing on the shore, as the windows shook in resistance. We were silent. We hadn’t come all this way to go back down at one in the morning. But, what could we say? So we ate our yogurt and muesli, waiting quietly. Within 30 minutes, some groups prepared to leave, so we followed suit. We dressed ourselves layer upon layer, topping our thermals with fleece, topping our fleece with water-resistant trousers and coats, wrapping a scarf around our necks, a balaclava over our heads, crowned with a beanie, held on with a head lamp. The only parts of our bodies showing were our eyes, like doormen looking out the peephole of a speakeasy. We stepped out into the blizzard and headed for the trail in darkness, defying Mother Nature’s wrath. We climbed extremely slowly. I focused on Sergio’s footsteps in front of mine and matched his pace. Stonie breathed deeply behind me, his footsteps falling in the same steady pattern. In an hour, we came to the glacier. Without question, we fished our crampons out of our packs, rehydrated and stepped onto the glacier, tied together in our harnesses. We followed the vague white trail Sergio lead us on in silence and began to switch back, left to right, back and forth, slowly rising. It was then the wind really became difficult to battle. Every turn into the wind, it pounded against my body, making the effort twice as difficult as snow flurries stung my tormented cheeks. Then every turn the opposite direction, walking with the wind, the brutal gusts shoved me, occasionally knocking me completely off balance. I would catch myself with my ice pick. Stonie would help me stabilize, and we would continue. We climbed for two hours, taking short rests now and again. The skepticism had been playing on my mind, between a therapeutic, silent counting and matching my steps with my inhalations and exhalations. I became certain I couldn’t make it to the top. “I can’t do this,” I finally confessed to Stonie and Sergio, shouting through the storm. “I’m not going to be able to do this for, how much further?” I asked, turning to Sergio. “Five hours!” I exclaimed. Impossible, I thought, with the gale wind’s unceasing assaults. However, we continued climbing for 30 minutes more, then we stopped to hydrate. I picked at the ice matted in the tiny lock of hair that had made its way out of my balaclava. “If you want to go back, we’ll go back,” he said, conceding defeat. He took my gloved hand and squeezed reassuringly. “I’m sorry,” I said. At that, we made our way back down, our joints disputing every downhill step we took, our crampons securely insuring we wouldn’t slide down the glacier. We walked in silence back to the refuge, feeling disappointment with each stomp, but also feeling immense relief. It took about an hour and a half to make it back down, fighting the snow and the gale winds on our descent. At 4:30 a.m., we sat in Refugio José Ribas and sipped a satisfying, well-earned cup of peppermint tea, drained and at loss for words. Angela Allman is a writer and full-time traveler who gets her kicks from scuba diving, snowboarding, listening to music and napping. She now spends her time in English pubs, toasting pints to the blank page, which you can find at TravelingAnge.com.